MOSCOW. Aug 23 (Interfax) – Russian consumer prices were unchanged in the week of August 15-21, the Federal State Statistics Service (Rosstat) said. Russia had 0.1% deflation the previous three weeks as prices fell for the first time since early August 2016. Inflation was much lower than expected at 0.1% in July despite weekly inflation for the month being 0.3%. Inflation was 0.2% in the first 21 days of August and 2.2% between January 1 and August 21. Average daily deflation was 0.010% since the beginning of August, compared with 0.001% deflation in the same period of last year. On this basis and given the annualized inflation rate of 3.86% at the end of July, annualized inflation remained below the 4% target, falling to 3.7%, down from 3.8% on August 14. Fruit and vegetables prices fell 3.6% on average last week: cabbage prices fell 10.2%, and potatoes, onion, carrots and tomatoes fell 6.7%-9.4%, however cucumbers went up 1.7%. Eggs, granulated sugar and buckwheat fell 0.7%-0.8% in price and milk, millet and vermicelli pasta fell 0.2%-0.4%, while mutton, canned meat, cooked sausage, butter, margarine, smetana cream, quark cheese, ordinary cheeses, bread, chocolate candies, hard candies, tea and rice went up 0.1%-0.2%. Gasoline went up 0.1% and diesel fuel was unchanged. Deflation in Russia in August does not bear risks and inflation in the second half of 2017 will be near the target level of 4%, a Central Bank of Russia spokesman told Interfax last week. “The decline in prices seen in late July and the first half of August is characteristic for this time of year. To a significant degree, it is due to the seasonal decline in prices for food products, first and foremost fruit and vegetable products. Deflation in August as a whole bears no risks: deflation in August has been recorded in previous years. Food price declines also occur in September. The Central Bank forecasts that annualized inflation in the second half will be near the target level of 4%,” the spokesman said. 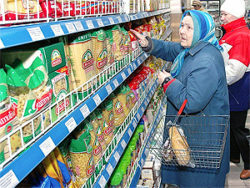 The Russian Economic Development Ministry expects there to be 0.3%-0.5% deflation in August. Annualized inflation could be way below target at 3.3%-3.6%, down from 3.9% in July. The Central Bank is targeting inflation of 4% by the end of 2017. The Econ Ministry is forecasting 3.8% inflation for the year. Economic Development Minister Maxim Oreshkin has said there are no plans to alter the forecast to any great extent.